While on a drive with his brother and father, a young boy was suddenly transported to the Rock of Eternity. A dying wizard (Djimon Hounsou) tells him that he is looking for a young boy of pure heart to bestow his magic upon and protect the world from the seven deadly sins. The wizard tests him and he fails where he is sent back to his family. Distraught over the experience, he causes the family's car to crash. Years later, another young boy, Billy (Asher Angel), tricks the cops in order to find his lost mother's address on their database. He is eventually caught and placed with kind foster parents who are also looking after several other children. He initially resents their kindness, wishing he could leave to keep looking for his mom, thinking it was his fault that he grew up without his parents. Despite his disinterest with his new family, he helps one of his new foster brothers, Freddy (Jack Dylan Grazer), after he is picked on by bullies. The bullies chase him and he finds himself in the Rock of Eternity and meets the wizard who is now desperate to bestow his powers. He gives his powers to Billy, which turns him into a superhuman adult man (Zachary Levi) with various unknown powers. Elsewhere, we find out the young boy from the opening scene has grown up into Dr. Thaddeus Sivana (Mark Strong) and is obsessed with proving the event that caused his family's car crash. He succeeds and returns to the Rock of Eternity. Instead of getting the wizard's powers, he is possessed by the seven deadly sins once trapped in statues around the wizard's lair. Billy tells Freddy about what happened to him and the two test his new adulthood and powers. One stunt attracts the local news as well as Dr. Sivana, who attacks Shazam in order to defeat him and secure his power. In order to defeat Dr. Sivana, Billy must learn that he can't do it all alone. It's the superhero equivalent of 13 Going On 30 where a teenager suddenly turns into a superhuman adult and enjoys his newfound superpowers and freedom—before the supervillain catches up to him, that is. Zachary Levi is no stranger to superhero movies, having appeared in the Marvel Cinematic Universe as Fandral, one of Thor's closest friends. He is best known as Chuck in the TV show Chuck that aired from 2007 to 2012, as well as the voice of Flynn Rider in Disney's Tangled. He was last seen as Benjamin in the second season of the critically-acclaimed TV show, The Marvelous Mrs. Maisel. Mark Strong is an English actor who has appeared in award-winning films such as The Imitation Game and Tailor Tinker Soldier Spy. He has previously appeared in another movie based on a DC Comic, Green Lantern starring Ryan Reynolds, as Thaal Sinestro. Prior to playing Dr. Sivana, he played Merlin in Kingsman: The Secret Service as well as its sequel, Kingsman: The Golden Circle. Billy Batson is definitely Asher Angel's biggest role to date, but he broke out as Jonah Beck in Disney's hit TV show, Andi Mack, that premiered in 2017. He also starred in the movie Driven To Dance that came out in 2018. At 15 years old, Jack Dylan Grazer has been in his fair share of big movies. He played Eddie Kaspbrack in the 2017 remake of Stephen King's It (and will reprise the role for the 2019 sequel) and played the young Nic Sheff in Beautiful Boy, the same role played by Timothee Chalamet. On TV, he also starred in the short-lived series Me, Myself, & I starring SNL's Bobby Moynihan and John Larroquette. Djimon Hounsou adds to the growing list of actors who have appeared in both MCU and DCEU. Before his role as the wizard Shazam, he was last seen as part of Vers' Kree team in Captain Marvel. He seems to be a frequent performer in superhero titles, having also voiced King Ricou in Aquaman. He even played T'Challa in the Black Panther miniseries in 2010. 1. While there is no official word yet if Shazam will officially join the Justice League, an exciting cameo (of a certain man in a cape) at the end of the film confirms that the film exists in the same universe as movies part of the DC Extended Universe. 2. In the comics, Shazam was originally called Captain Marvel. It predated Marvel's heroine by at least 20 years, first hitting the stands in 1939. This means that two Captain Marvel movies were released within a month of each other and that both films include actor Djimon Hounsou in the ensemble. 3. As DC did not own the trademark for Captain Marvel, Zachary Levi's character is referred to as many other superhero names by his friend, Freddy Freeman. The character was only officially called Shazam during the 2012 rebirth of the character in DC Comics. 4. "Shazam" is actually an acronym of the gods that bestowed him his powers: S for Solomon, god of wisdom, H for Hercules, god of strength, A for Atlas, god of stamina, Z for Zeus, god of power, A for Achilles, god of courage, and M for Mercury, god of speed. 5. Shazam is one of Mars Ravelo's inspirations for Darna. His protagonist famously turns into her superhero alter ego, after swallowing a stone and yelling her superhero name, "Darna!" Children-led adventure movies are always entertaining, and this is no different. In fact, the best thing about this movie is the young ensemble. Apart from Asher Angel who plays Billy Batson and Jack Dylan Grazer who play Freedy Freeman, other kids in the cast include Ian Chen (most known for playing the youngest kid in Fresh Off the Boat) and Faithe Herman (who plays Randall's youngest daughter in This Is Us). 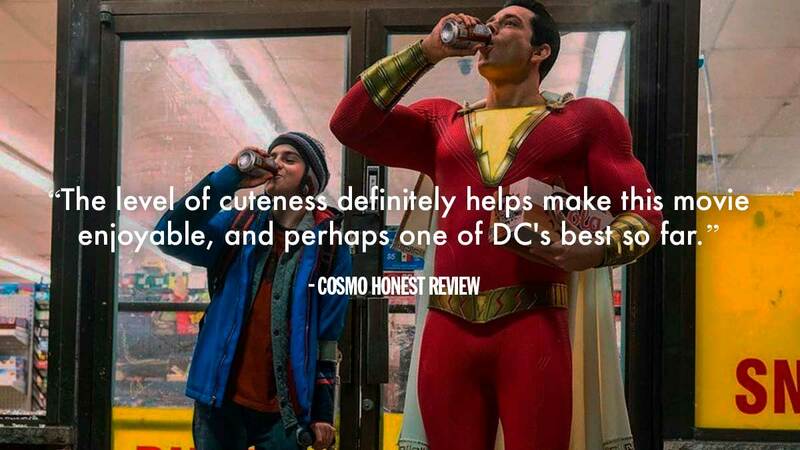 The level of cuteness definitely helps make this movie enjoyable, and perhaps one of DC's best so far. It's not very complex, and the morals it tries to teach is very obviously laid out. Billy learns the meaning of family, and the importance of asking for help. The best parts of the film were the scenes where Freddy and Billy were testing out Shazam's powers and also testing out his newfound adulthood like trying to get each other out of school or trying beer for the first time. The movie is a little goofy, which adds to its people-pleasing charm. It gets a little absurd with the magic aspect of the story. The wizard who would eventually give Billy his Shazam powers essentially abducts kids to test them if they're worthy. If he doesn't find them good enough, he dumps them back to their normal lives without explanation or even proof. This very event actually caused Dr. Sivana's (Mark Strong) villainous turn. The wizard himself created the supervillain that would eventually (spoiler alert) destroy him and take on Shazam. The movie's highlights were also when it takes itself a little seriously as with the whole arc with Billy looking for his mother. Its heartbreaking conclusion tells the audience that the movie isn't all just fun and games. As with all superhero movies, Shazam also features a lot of fight scenes including a very long one towards the ends. A very important twist happens in the midst of this, but otherwise, the showdown between Shazam and Dr. Sivana is too long and not really that interesting to watch. This movie is great for anyone looking for a family-friendly flick to enjoy. Sure, they say bad words sometimes, and the monsters wouldn't be out of place in horror movies, but the movie offers a lot of laughs. It isn't deep at all, so you pretty much just have to sit back and enjoy the ride. I also recommend this movie to Marvel fans who have yet to explore other superhero universes. Shazam is very accessible and stand-alone. You don't need to brush up on the DC universe or watch all the movies that came before it. Follow Nikki on Twitter and Instagram.